Quite frequently we have been asked for affordable bass speakers that are capable of doing big jobs. One solution would be to use several bass reflex speakers. However, this type of speaker is not powerful enough for outdoor use, since a much higher amplification is needed for adequate bass. Those who want a lot of bass with relatively little amplification should use rather a bass horn. A much higher sound pressure level and better bass response is ensured by a more efficient impedance adaptation to the ambient air. At these high outputs a passive crossover becomes quite expensive. Therefore, we recommend to use an active one. The advantages are that there are no further costs for additional crossovers and frequency adjustments is more accurate, resulting in a better sound. If you still prefer to use a passive crossover, we have a crossover kit available for 800 Watt continuous (same as EM-152Sub). Picture right: a view of the horn from the front, still without the bracing wedges in the centre. Here is a building instruction for simple folded bass horn. The method: the sound is compressed in a pressure chamber, then released through the side openings and adapted to the air by the horn. A great and affordable driver for a horn is the Eminence Kappa 15LF with a power handling of 600 Watts. 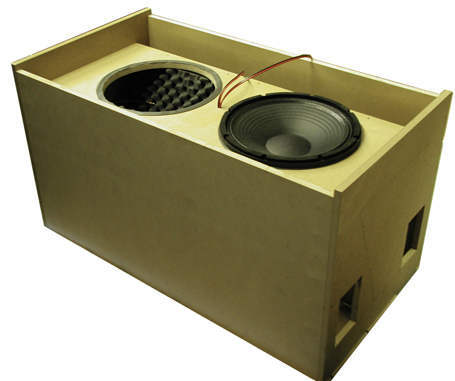 A simulation achieved a maximum sound pressure level of more than 130 dB (1 metre) at 2 x 600 Watts. 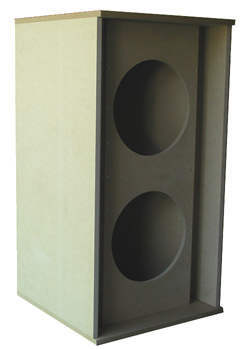 To achieve the same sound pressure level with conventional bass speakers approx. 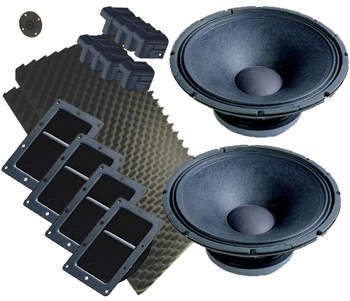 8 bass reflex speakers with the same drivers are needed. 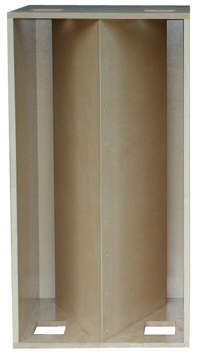 Picture right: The speaker seen from behind without rear wall. The driver here is, however, an Eminence Pro 15, also an excellent choice. 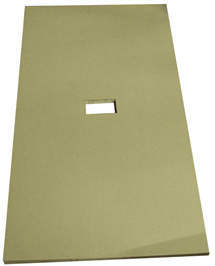 19 mm MDF (or Multiplex) should be used; the rear wall should be made of 28 mm MDF or Multiplex. Please note: For easy maintenance the rear wall should only be screwed not glued. Attention should be paid to tight screwing down of the rear wall. Additional struts for fitting the rear wall are recommended.